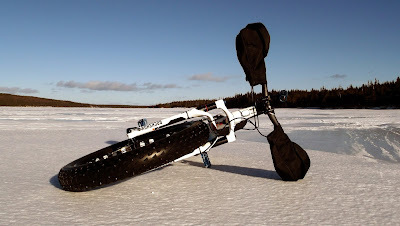 During the winter fatbiking season I normally get by with wearing a pair of lightweight gloves, possibly doubling up when its going to be chilly. I find that wearing bulky gloves gives me less dexterity when shifting and braking and makes it virtually impossible to operate the tiny buttons on any sort of action camera. 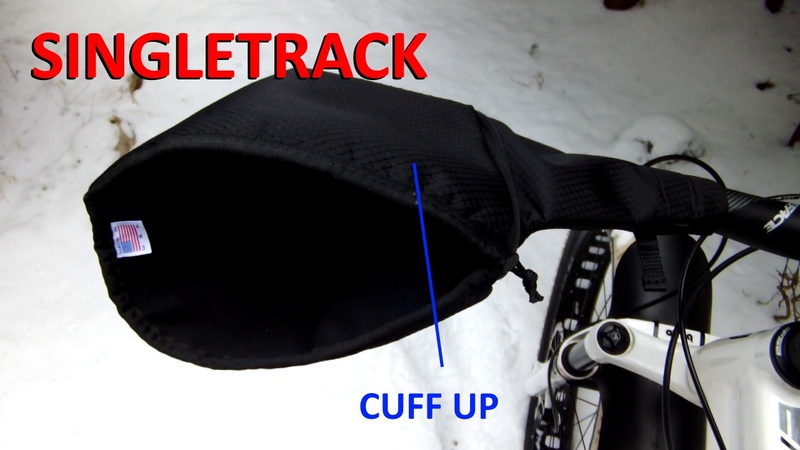 That worked until a recent ride when my hands got EXTREMELY COLD. So much so that I could not shift and braking was a problem. It was not pleasant. In the cold climate fatbikeing world we are all familiar with pogies and what they do . 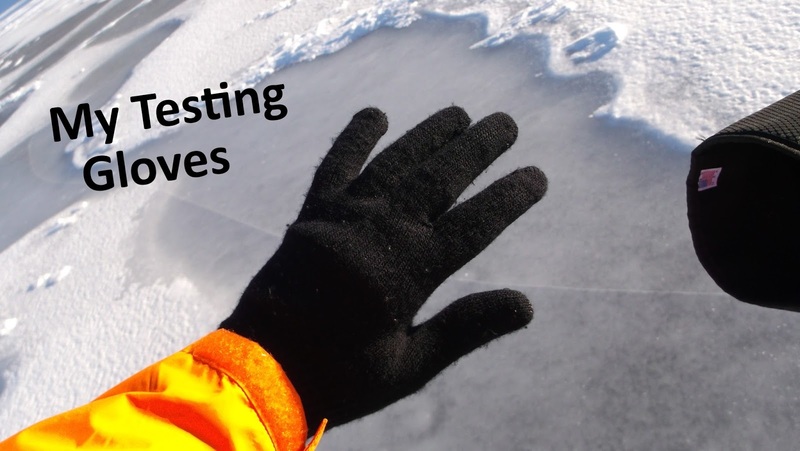 . . protect our hands from the ravages from old man winter. In recent years I have noticed an increase in pogie offerings. From the inexpensive, flat, "neoprene" type material to the premium, ultra cushy models that would not look out of place on a bed at a premium hotel. 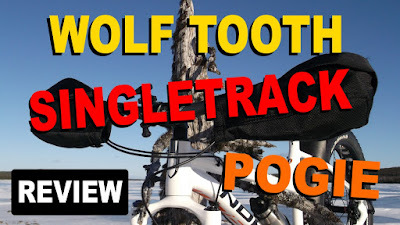 Minnesota based Wolf Tooth have recently entered the pogie ring with their, designed and manufactured in the US, Singletrack Pogie and Fatbike Republic got their chilly hands on a set for testing. 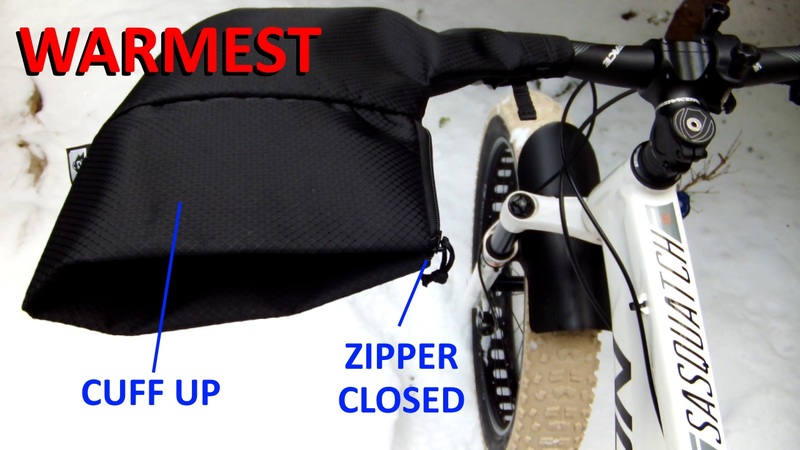 Three key features to the Singletrack are ease of entry and exit, adjustable warmth settings and quick install\removal. 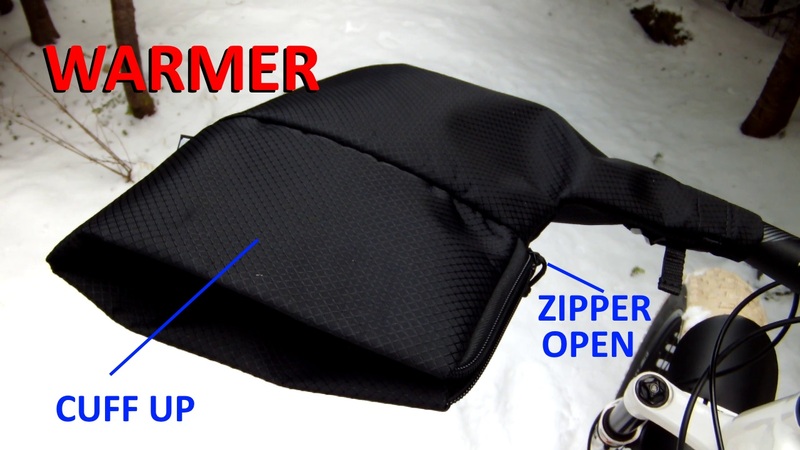 It is well constructed with the 420 diamond rip-stop nylon covering a closed cell foam center with an interior jersey lining. 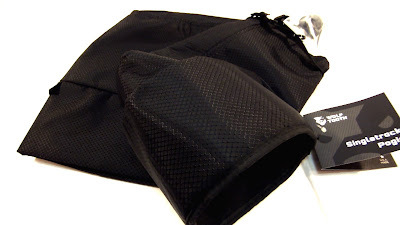 Although not considered completely waterproof it will keep your hands dry in all but a complete submersion. 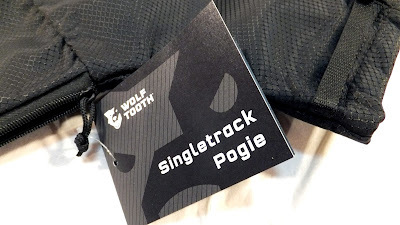 Instead of a temperature rating, Wolf Tooth offer three warmth settings based on three configurations of the pogie. 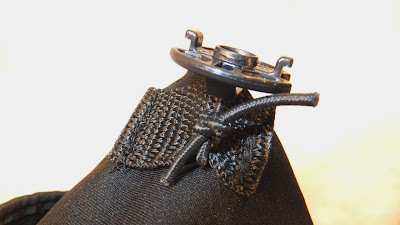 In the warmest setting the cuff is up and zipper closed, the warmer setting has the zipper open and cuff up, and warm setting has the cuff folded down . . . this is also known as the singletrack mode. Mounting the pogie involves installing a 1/4 turn bar end plug in the bars and attaching a bar end cap on the inside of the pogie. This cap attaches to the plug with a 1/4 turn and keeps the pogie perfectly aligned. Velcro and a cinch strap also keep the pogie attached to the bars. Take a peek at the video to see the installation process. To test the limits of the pogies I dug out the slightest pair of gloves I could find and hit the trails. My hands easily slid in and out of the pogies in all warmth settings. I did not even have to glance at the bars when riding in singletrack mode. Did my hands stay warm? You betcha. I mostly ran them in the singletrack mode and had to move to the warmer (cuff up) and warmest (cuff up and zipper closed) a couple of times when it got extra chilly. Take a look at the video for conditions and temperatures. The bar plug does indeed keep the pogied aligned on the bars. 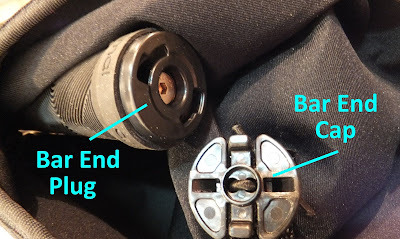 My less than stellar knot tying ability caused the bar end cap to separate and the pogie lost its orientation. When I retied the end cap I made sure it was not going anywhere. One unexpected benefit that I stumbled across while riding some ATV "singletrack" was that they protect your hands from whipping branches. And there was no damage to the pogies besides a couple of scuffs. Impressive. Before strapping the Singletracks to my bars I was not entirely sold on the whole pogie thing. I didn't want pillows on my bars nor did I want oven mitts, I was concerned about getting my hands on the bars and I have seen too many pogies wrapped in duct tape to cover rips. 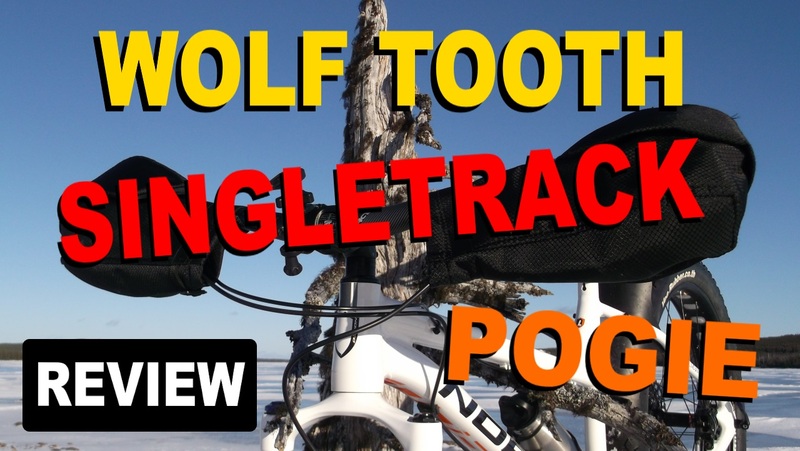 I can describe the Wolf Tooth Singletrack Pogies in one word - AMAZING. 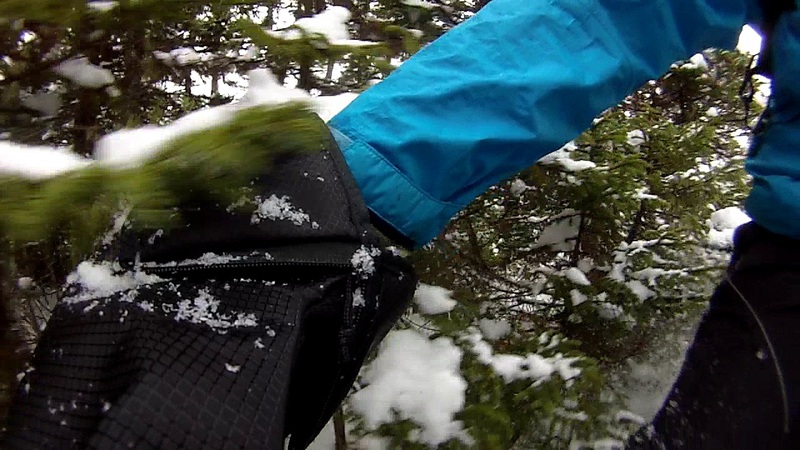 Not only did they keep my hands toasty warm, they were also protected from nasty branch whips. Shifting and braking were not impeded and there were no issues getting my hands in and out. And they are tough and look good. So if you are looking for a set of pogies, or even if you're not, head on over to Wolf Tooth and take a closer look at their Singletrack Pogies. They are definitely more than meets the eye! Ten years ago i made some compression rubber plugs actuated with came levers from skewers. They were attached to the pogies.All you had to do is insert them in your handle bar then flip the came levers. No need to manufacture special parts. Ahh . . . interesting. Thanks for sharing Pierre.